In Toronto, you have the chance to dine over 1000 feet in the air at 360 The Restaurant at the CN Tower. The award-winning eatery offers a revolving view of the city below and serves a rotating menu featuring Canadian ingredients. The CN Tower is one of Toronto’s top attractions and combining a visit here with a meal at the restaurant makes for a great experience in the city. 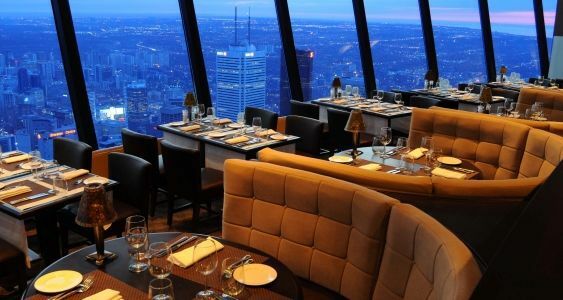 If you’ve ever been curious about visiting, read on for all the details you need for dining at the CN Tower’s restaurant. It’s not recommended to just show up and hope for a table if you’re looking to dine at the CN Tower. You might get lucky and snag a seat, but reservations are recommended. You can make a reservation online or by calling the restaurant at 416-362-5411. If you’re hoping to visit the restaurant for a special occasion such as a birthday celebration or anniversary, it’s a good idea to make your reservations well in advance so you can make sure you get a table. When it’s time for your visit, it’s also recommended to arrive 15 to 20 minutes prior to your confirmed reservation time to so you can get up to the restaurant and check in. 360 Restaurant is open for reservations daily from 11 am through 2:15 pm for lunch service and 4:30 pm to 10:15 pm for dinner service, so that means you can visit for either lunch or dinner, depending on your schedule and dining desires. The menu here, which puts the spotlight on Canadian ingredients that represent the country from coast to coast, change twice a year for summer and winter. The summer menu starts in May, while the winter menu begins in November. Menus for the next season are posted closer to the starting date. You can choose to order a la carte, or opt for the prix fixe menu. For the prix fixe menu, you have the choice of two courses for CAD $65 or three courses for CAD $79. The prix fixe menu tends to be a better value and offer more options. Another feature of 360 Restaurant is their unique wine cellar. Usually, when you hear the word “cellar” you think of something being underground. In this case, the wine cellar is actually 1151 feet in the air, making it the highest wine cellar in the world according to the Guinness Book of World Records. The sky-high wine cellar was designed and created to resemble a typical underground wine cellar, and this one features climate and humidity controls to ensure the wine is stored in ideal conditions. The cellar has a storage capacity of 9000 bottles and also contains a tasting table. The restaurant serves more than 500 wines from around the world. The CN Tower’s 360 Restaurant is higher-end and elegant without being stuffy. The dining room is airy, and thanks to the floor-to-ceiling windows, bright with natural light during the day. There are tables closer to the windows and banquettes further back. There is no set dress code, but the best rule of thumb is to go for something smart-casual. Think neat and put-together but not overly formal. By dining at 360 Restaurant you can expect a well-prepared meal with an incredible view. And by making a reservation, you get to skip the lineup for the tower and head straight to the restaurant. Following your meal, if each guest purchased a prix fixe meal, you have complimentary access to the Lookout and Glass Floor meaning you can make a whole afternoon or evening of your CN Tower experience. In terms of seating tips, ask for a window seat to get the best views (although they will generally not guarantee this). You get great views no matter where you sit, but right at the window is more optimal. You may also want to consider going at dusk to take advantage of both daytime and nighttime views of Toronto and to ideally catch a sunset. And if happen to go on baseball game night in the summer when the Rogers Centre dome is open, you'll be able to see the game going on from 360 Restaurant. Don't have to pay admission to CN Tower; it is included in the price of your meal at 360. After your meal, you are welcome to stay as long as you like at the tower's Lookout and Glass Floor levels. Portions are generous. You won't leave hungry. Relatively expensive - prix fixe is about CAD $65 to $79 and entrees run at least $40. A couple should expect to pay CAD $250 with wine, tip and tax. Though the food is better than your average tourist attraction fare, it is still not the city's finest dining.